I got my introduction to parabolics with the solar burner--which is aptly named--it's a fantastic solar cooker and can achieve the highest temperature of any solar cooker on the market. For school demonstration purposes I needed a parabolic cooker that had less performance and would be more simple to move around. 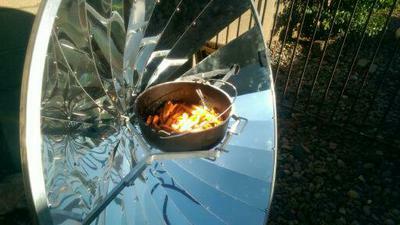 The solar burner was a little much for us so we decided to try the Sun Chef. My 12 inch dutch oven fits in the cooking area. I can bake with it--and the direct sun will actually brown or burn compared to the Sun Oven (which I also highly endorse). You can char red peppers, for instance. 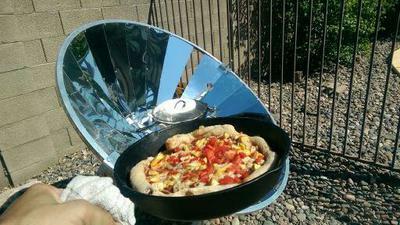 My greatest success was actually making pizza--something that is a real challenge for solar cooking. You can boil water--as when I cooked red lentils the other day. But you surely can cook pasta, or anything where you want a low boil. I make toasted cheese sandwiches. Only tip is this oven can heat the pan from the top and bottom--which is why it can bake-so when I use my cast iron saute pan--I often will put the lid on it--so that food doesn't burn from the top. It is super easy to adjust to the sun. And you rotate it upside down when not in use. I like the material it is made out of but it will be harder to replace than the simpler solar burner. There is not a replacement reflective mylar material. With about 24 polished aluminum strips that you align when you put it together-That's the biggest challenge I managed to damage one by tearing it where the hole to fit the bottom screw was-but it's mainly cosmetic. I've talked to the owner who plans eventually to introduce one with fewer panels--but once you have it together you'll be very happy. Note--the pictures show one missing panel- Mine did come one panel short, 23 instead of 24. While I've been in communication with the owner on that who is also from Arizona. But it has neglible effect on performance and may be a plus for any wind disturbance and isn't a major issue for me. 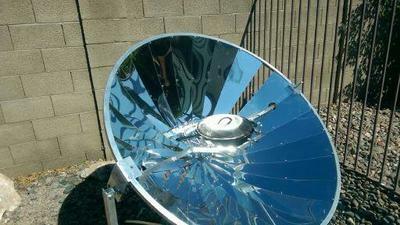 The Sun Chef is a decent solar cooker. Comments for A decent oven.